One of the important benefits of destination medical care is a significant financial savings over costs in a patient’s home country. The chart below outlines some of the savings that can be realized through Soter’s Center of Excellence Network of doctors and hospitals. Many other companies tout only the savings against US billed charges. We believe this can be misleading, especially for patients with health insurance. Consequently, Soter shares both billed costs and typical insurance negotiated savings levels. 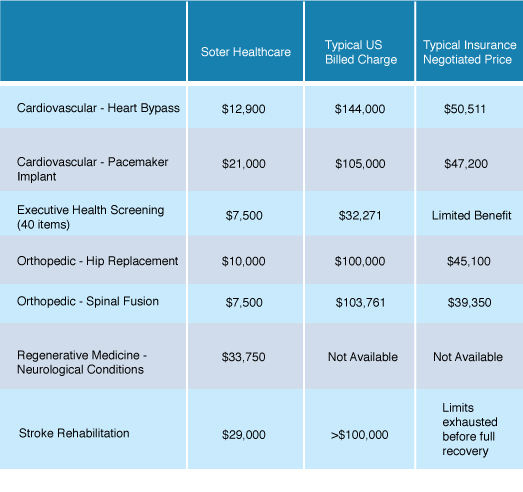 It is also important to note that the table below reflects general costs. Your specific condition and situation will dictate the costs you may expect. Contact us for specific information about your care. We will gladly provide what you need to make an informed decision. Information regarding approximate costs for medical procedures is compiled from multiple sources and is believed to be accurate at the time it was gathered. This material is provided for the purpose of general comparison. It is not intended to be comprehensive and does not cover all diseases, physical conditions, ailments or available treatments.